How to feel more secure and in control throughout your performance. One of the methods I use to improve practice and memorisation of a piece is something I call “mapping and signposting”. It’s a way of breaking a piece into sections and helps me feel more secure during a performance. If you’ve ever started to play a piece and found yourself on “auto-pilot”, you might remember the feeling of being slightly out of control? Often, the muscle memory enables us to make it through to the end of the piece safely, but sometimes, there is that crash and burn moment. It’s not something anyone likes to feel. A clear mental image of a road map is similar to having a clear mental image of the structure of a piece of music. How can we become more in control when performing or learning a piece on the guitar? We can create a mental map of the piece just like a road map and use this as our back-up plan, or indeed our main plan. We can work out how many main sections there are (like motorways), where the main themes are (A roads) and where the smaller phrases are (B roads). Delving into the structure of a piece can really help create a secure mental map of it and improve practice. Here’s the M25 circling London. A clear mental image of a road map is similar to having a clear mental image of the structure of a piece of music. Playing a piece without knowing its structure is rather like setting off in a car, following a sat nav without any sense of geography or any clue as to where we are – hoping that nothing goes wrong. 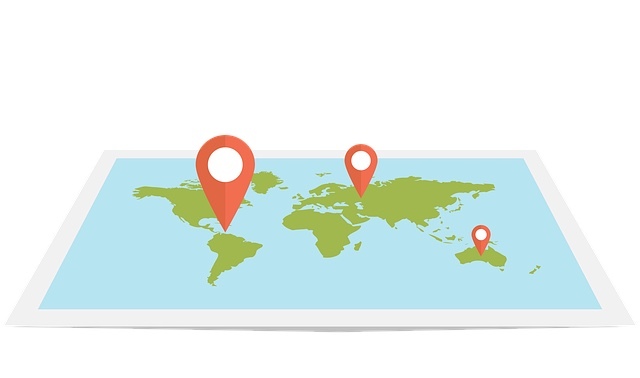 Sometimes, looking at a map in advance can make all the difference. Having the back-up of knowing which motorways and which A and B roads to take, can give a lot of confidence. When driving on remote country roads, or roads hundreds of miles from home, it’s nice to know that if the sat nav breaks down, there’s a small back-up plan at least. Similarly, in order to improve practise, it’s good to know how all the sections of a piece fit together, where the key changes and repeats are, how the tune and accompaniment fit together and which rhythmic motifs re-occur. I also like to use “signposting” when learning a piece. Sometimes our mental map of the piece we are learning can be confusing, messy and daunting. A large section of a piece may seem to have an overwhelming number of notes and phrases. I like to break these sections down even further and put signposts at various points in the music. Some musicians call them pick-up points. I find that this helps to improve practice. 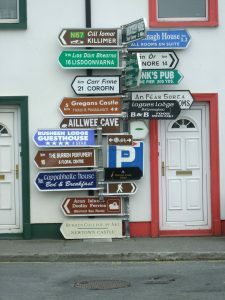 Too many signposts can be daunting. Writing phrase marks to your music will help clarify musical structure. Signposts/ pick-up points are places in the music that we might be able to pick-up from, should the memory of a few notes falter. They are also the points from which we can start to practise thus avoiding the necessity of having to return to the start of a main section in order to practice a tricky passage a few lines in. It’s a very time-efficient way of practising, creates good practice habits and encourages a secure knowledge of the piece. Being able to play a few bars from all of the signposts/ pick-up points of a main section, without referring to the music gives us the confidence to know that the mind map of the piece is secure. Working out specific fingerings for these points and writing them into the score is very helpful. Being able to play from all of those signposts/pick-up points out of context also ensures that they are known thoroughly, as “auto-pilot’ or muscle memory will not work in these situations. What do my signposts look like on my scores? Sometimes, I use ticks, squares, triangles, asterisks – any mark will do! An example of how I might annotate music. Here’s a study by Carcassi. The piece is in binary form, the green asterisks are pick-up points and the purple marks indicate what chords or key are being used. 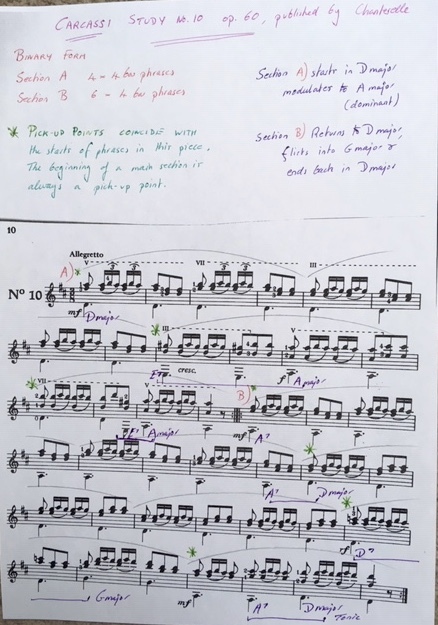 In summary, to feel more in control when practising, memorising and performing, try creating a mental map of your pieces, rather like a road-map. Analyse the structure of the pieces, divide them up into main sections and smaller sections (like Motorways and A / B roads), then annotate these sections with signposts/ pick-up points. Practise from these points and perhaps practise them out of order and out of context so that you get to know and memorise them really well. Having a clear structural map of a piece in my head, together with lots of marked in pick-up points/signposts really helps me feel secure and in control. 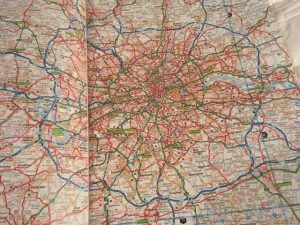 “Mapping and signposting” helps me focus my mind and be time-efficient. We all have different ways of practising, learning and memorising but maybe this method is worth considering if you’ve not tried it before?